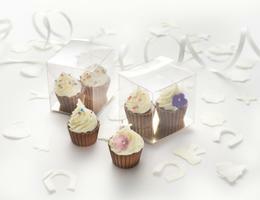 For a unique range of edible wedding favours, take a look at our beautiful chocolate favour ideas. From personalised chocolate pizza slices and chocolate plaques to chocolate cupcakes, lollipops and macarons, we want to make your wedding favour selections as seamless as possible - so there's one less thing to worry about in the run up to the big day. Take a look at our range below and if you have any questions, then please don't hesitate to give us a call. If you’re planning a wedding, you’ll probably have spent much longer than you’d like weighing up a long list of things you want, need and you’re supposed to have. You’ll probably also have spent a considerable amount of time thinking about how you can make it a memorable occasion personal to you. It’s not easy planning a wedding, but no one ever tells you that. Its lots of decision making and while some of its fun, some definitely isn’t. 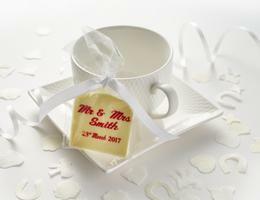 It’s planning little surprises for your guests, like personalised treats, that recapture the excitement and help you retain control of your day, That's why we offer a range of personalised wedding favours that are unique and timely. 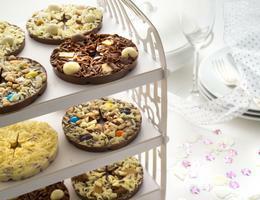 Our chocolate wedding favours have become increasingly popular as they can be individually tailored for your wedding. 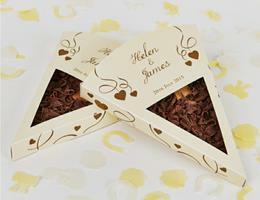 You can add your colour scheme to the packaging and personalise treats with your newly married name. We create Instagrammable wedding favours that your guests will love, not only because it’s a memory from your day, but also because it’s edible. Let’s face it who doesn’t love a sweet treat? Our chocolate wedding favour range features personalised chocolate pizza slices, personalised wedding favours which are engraved chunks of Belgian white chocolate crafted by our amazing chocolatiers, a tasty selection of macarons in a variety of flavours and fillings, chocolate lollipops and the most amazing cupcakes, made with a solid milk chocolate base and decorated with beautiful intricacy. 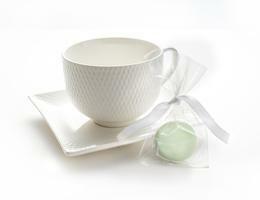 Our wedding favours are popular additions to the buffet table but they also make great centrepieces as well. 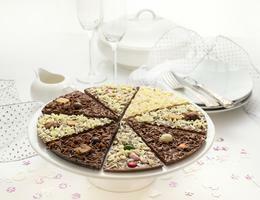 Our delicious chocolate pizzas are the perfect pre-dinner nibbles and your hungry guests will thank you dearly you thought of this unusual and exciting treat. One of the best things about our edible centrepieces is that they are designed to suit everyone. We combine several different flavours so even the most fussiest of diners will find something to suit their appetite. 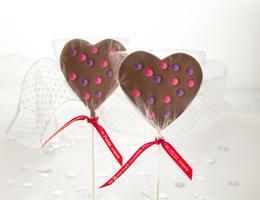 We also have child-friendly chocolate lollipops to tempt them into their best behaviour as well. A birdcage filled with our unique cupcakes and mini chocolate pizzas is also a popular centrepiece. Guests can take one as they please and people are always left surprised by the solid chocolate base instead of cake or pizza dough. After all they’ll be seeing enough cake later. 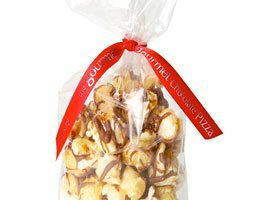 If you’re looking for unique buffet or wedding favours, you’ve come to the right place. Take a look at our range and if you have any questions, get in touch.